ASEAN- Association of South-East Asian Nations consists of 10 nations and 2 observers and secretariat at Jakarta, Indonesia. They are vital nations of South-East Asia to bolster economic relations between India and South-East Asia and India's "Look East" policy. This is the 13th India-ASEAN summit held at Kuala Lumpur, Malayasia. PM Narendra Modi attended the summit and concluded his speech by stressing the highest priority to build strategic and economic partnership with South-East countries. PM started his speech by congratulating the PM Razak for his hospitality and warm welcome. PM said that they had met at the time of multiple gobal challenges and the India-ASEAN were the bright spot of optimism. PM also outlined the key aspects of Trade, Connectivity, and Economic Developement partnership with ASEAN. India-ASEAN population of 1.9 billion and trade of $76.5 billion in 2014-15 and has investment in both directions. India and ASEAN can grow trade and investments as both economies grow. PM also included in his statement "We can also draw confidence from the progress in our framework of cooperation. The entry into force of our Trade-in- Services and Investment Agreements in July 2015 is a major step forward"
PM stressed on the better Connectivity between ASEAN ans India. The Trilateral Highway should be completed in 2018 and also put forward a Line of Credit of $1 billion to improve physical and digital connectivity among ASEAN and India. A Special emphasis will given to Cambodia, Laos, Myanmar, and Vietnam (CLMV) countires. The Project development fund will created to promote manufacturing hubs in CMLV countries. Excellencies, science, technology and innovation constitute a vital pillar of our cooperation and support our economic partnership. We will enlarge the ASEAN-India Science and Technology Development Fund from the current one million U.S. dollars to 5 million U.S. dollars. India offered ASEAN our indigenously developed GPS Aided Geo Augmented Navigation or GAGAN services, which provides advanced navigation and location assistance and information facilities. And, also offers collaborative initiatives in the field of Ocean or Blue economy, food security, medicines, and clean energy. India proposed to open an ASEAN Studies Centre in our Northeastern Hill University in Shillong. PM stated "We should evolve specific plans of cooperation in maritime security, counter-piracy and humanitarian and disaster relief." PM also stressed on better cooperation on outer space technology and Cyber security. India-ASEAN summit held in January 2015 on basis of Cyber Security should be used as springboard. India attaches the highest priority to this partnership and, in recognition of that, we have opened a permanent mission to ASEAN in Jakarta. 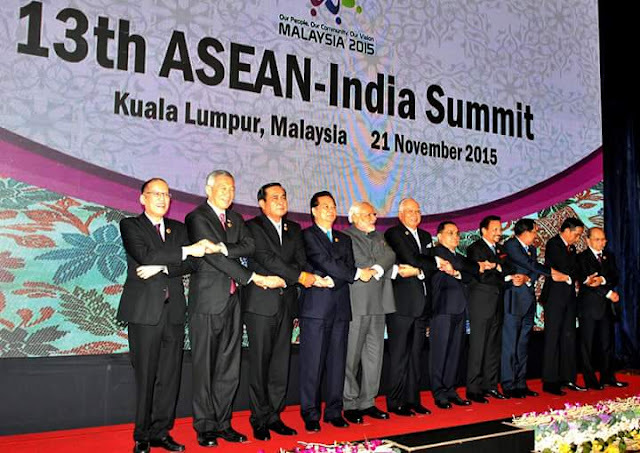 Comments "PM Statement at 13th India-ASEAN Summit 2015 in Malaysia"